I'm back from a three days weekend to Tours and I just found in my mail box the gift sent by the French philatelic service to their subscribers for the new year best wishes ! As we say in French : Mieux vaut tard que jamais (Better late than never). After all we are only in April... I anyway wanted to share with you this sending. There are two items. 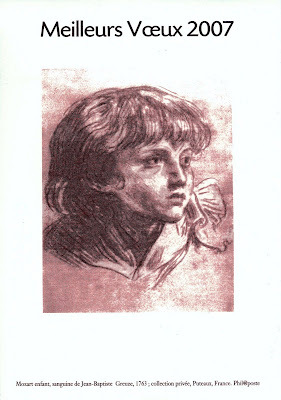 The first one is a engraving showing a portrait of Mozart by Jean-Baptiste Greuze designed in 1763. It looks actually better than on the scan. I could not find a good way to get a better result with my scanner. Jean-Baptiste Greuze is a French painter born in 1725 who died in 1805. 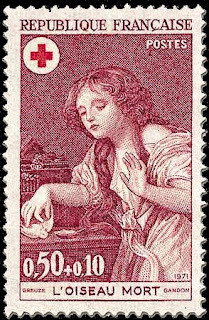 If you collect French stamps then you may know that three paintings from JB.Greuze have been pictured on stamps. 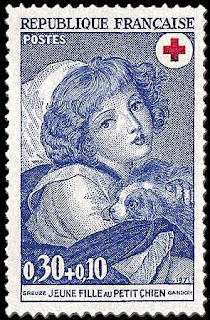 In 1971 in a set issued with a surcharge in favour of the Red Cross, two stamps picture works from Greuze : "Young girl with a puppy" and "The dead bird". 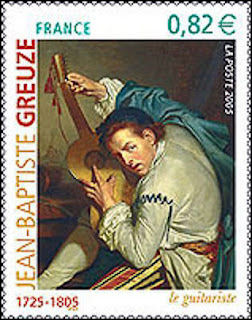 In 2005 another stamp was issued picturing The guitarist, a painting from Greuze. Now back to the gift. As I said there was two items. The second one is this souvenir sheet. 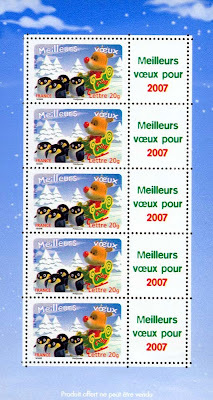 This sheet contains five stamps that re-use the design of the best wishes stamps issued end of last year. The stamps are printed se-tenant with a label. It is to be noticed that this souvenir sheet can not be purchased from the French post. It is only available as a gift to the subscribers. The souvenir sheet re-uses the same design than another block of stamps that was offered by French post to the Post Office workers, but this one was using self-adhesive stamps, whereas the one I got is with "normal" gummed stamps.